Android manufactures have flirted with dual rear cameras for years. Previously it was for quasi-3D tech (see the ill-fated HTC EVO 3D), then for tricks like enhanced bokeh effects (see the slightly less ill-fated HTC One M8 and others), and now phones like the LG V20 are combining different lenses for different applications. 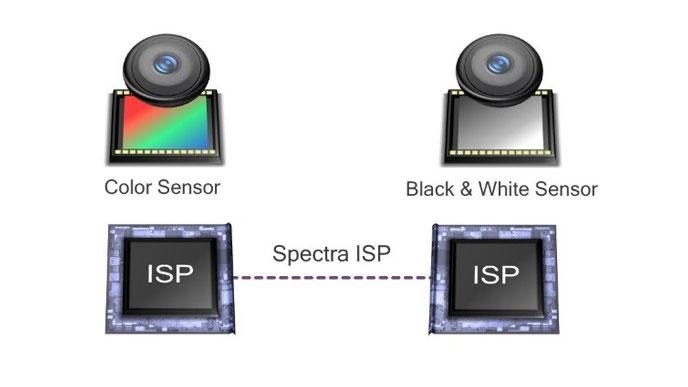 Qualcomm hopes to capitalize on this trend with its Clear Sight dual camera processing tech. Clear Sight, which is supported on the Snapdragon 820 and 821 specs, uses one camera-and-lens combo to shoot color and one to shoot in grayscale. This isn't an entirely new idea, but the gist is that the black-and-white sensor allows for greater low-light performance. When both sensors combine the images that are taken at the same time, the result is photos with better contrast, less noise, and more sharpness, especially in low light conditions. Qualcomm says the setup mimics the function of cones and rods in the human eye. Clear Sight pointedly isn't supported on the LG V20, because its sensors are set up with different lens angles, not dedicated to different kinds of processing. In fact, Huawei's P9 with its dual "Leica" lenses is probably the closest thing to it on the market right now, but that phone is using proprietary tech. Qualcomm didn't give any examples of current or forthcoming devices that use Clear Sight, though we might see some during the early 2017 product rollout season.